As part of the Work Welsh scheme for further education colleges, Pembrokeshire College e-Learning Designer, Ben Lloyd was recently presented with a national award for learning Welsh in the workplace. Nominated by the College’s Work Welsh Language Tutors for his remarkable progress during the scheme, Ben was presented with his award during a Sgiliaith training session. Shortlisted from nominations from across Wales, Ben secured the award for ‘Learner who has made the best progress at intermediate level’. As part of the Work Welsh scheme, Ben has been practising various language patterns; paying particular attention to grammar points; discussing a range of topics including social care, history, creative arts, business, sport and science and the Welsh language, with the aim of building confidence in speaking and increasing vocabulary. As a result, Ben has made tremendous progress and is eager to master the language even further and hopes to attend a residential course at Nant Gwrtheyrn in the near future. 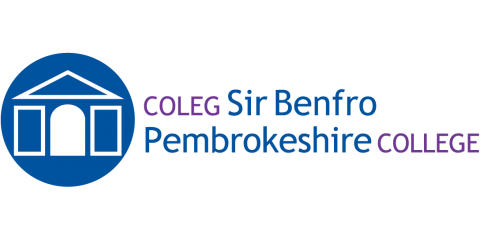 Within his role, Ben hopes to create e-learning modules through the medium of Welsh in the areas of childcare and social care which are priority areas for the College in developing Welsh-medium provision. Ben recorded an interview with Boom Cymru recently for a new programme about food producers, and he spoke Welsh for over four hours with the crew about his sea salt business Halen Dewi.